A last second goal to Sean Henson has seen East Fremantle win a tight encounter over Perth at Brownes Stadium. The Sharks extended their winning streak to three games with the thrilling two point win over the in-form Demons 15.18 (108) to 16.10 (106). The following members are celebrating their birthdays this week and we would like to wish them all a very Happy Birthday. THE MEMBERS DRAW HAS JACKPOTTED TO $450! The Friday night Member's Draw has jackpotted to $450 and you must be there to collect it. On Friday night just past, April 5th, Robert Treloar’s name was drawn out but he wasn’t in attendance so the draw has jackpotted by $50 to $450. Arthur Millard; Chris Lewis; Paula Brenssell; Kerry-Anne Cooper; Brian Peake; Paul Booth; Jill Birt; Deborah Preedy; Shaun Kelly; Michael Andrews; Robert Whiteman; Conor Boyd;Tyson Booth; Ethan Drake-Brockman; Dylan Munkelt; Robert Whitham. East Fremantle’s 13 year losing streak against Subiaco has come to an end in emphatic style, with the Sharks thumping the Lions by 69 points. Josh Simpson, Ryan Lester-Smith and Mitch Boyle each kicked four goals, as the Sharks’ tore the Lions to pieces, winning 25.11 (161) to 14.8 (92). The win was East Fremantle’s first over the Lions at home since Round 13, 2000. The Sharks will be looking to end an unenviable streak when they face Subiaco tomorrow having not beaten the Lions since Round 13, 2000 at East Fremantle Oval. There has been significant change to the line up that defeated Peel Thunder last week with some very exciting inclusions. The following members celebrated their birthdays recently and we would like to wish them all a very Happy Belated Birthday and apologise for their birthdays not being on the website. THE MEMBERS' DRAW HAS JACKPOTTED TO $400! 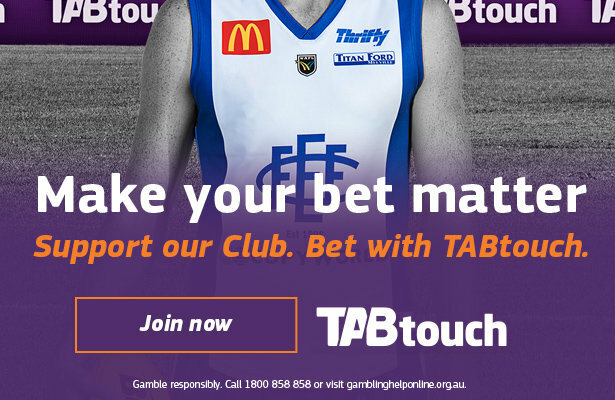 The Friday night Member's Draw has jackpotted to $400 and you must be there to collect it. On Thursday night just past, March 28th, (as Friday was Good Friday), Kristy Ganfield’s name was drawn out but she wasn’t in attendance so the draw has jackpotted by $50 to $400. Beulah Cronan; Raymond Firth; Patricia Windsor; Paul Bennett; Patrick McNulty; Paul Harding; Scott Kelly; Charlie Ricciardo; Scott Martin; Steve Blakiston; Miles Franklin; Connor Hagen; Jae Flynn; Jonah Finlay. East Fremantle will look to take their Mid West Academy to the next level during the offseason. East Fremantle CEO Adam Kelly said stronger communication between the Sharks’ and academy coaches will make for an improved 2013/14 program. Kelly said meetings held last week were aimed at brainstorming ideas on improving the academy blueprint.